SEOUL, June 17, 2012 – The LG Optimus L5, one of LG’s stylish, high fashion L-Series smartphones, will make its global debut in key European markets this month. The device will be available in the U.K., Germany and France, followed by markets in CIS, Middle East and Asia before crossing the ocean over to Central America and South America. 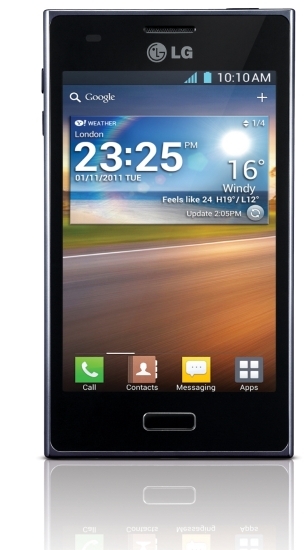 True to L-Style’s elegant design philosophy, the LG Optimus L5 is a seamless merger of style and technology. Dressed in a sensuously slim body measuring only 9.5mm, the smartphone comes packed with intuitive and intelligent features such as dual SIM capabilities (in Asia, CIS, Middle East, Central and South America only) and NFC “Tag & Play” (in Europe and North America) for mobile commerce and peer-to-peer sharing. Running on the Google’s latest Ice Cream Sandwich Android operating system, the LG Optimus L5 offers the best-in-class 4.0-inch display for a roomy and error-free mobile experience. The new user interface also lets you get more done with fewer finger taps. The Optimus L5 boasts LG’s new User Experience (UX) with QuickMemoTM which allows users the ability to instantly jot memos or notes from any screen without having to open a separate application.